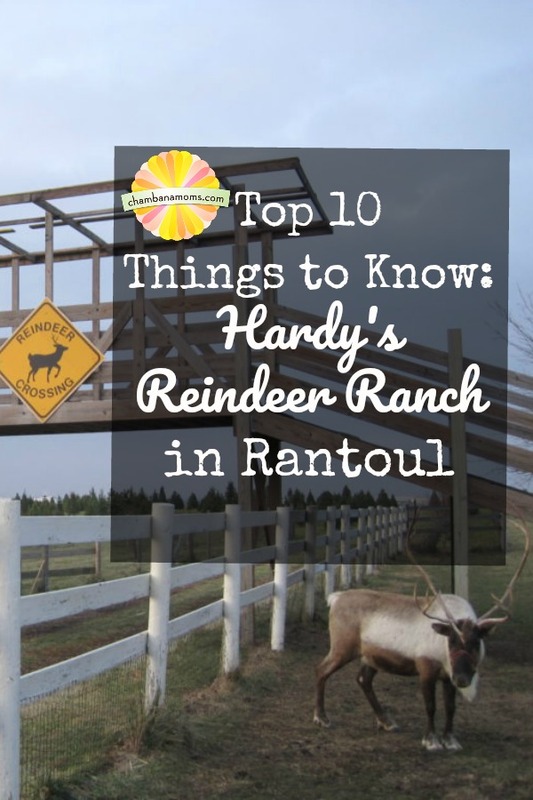 When we hear reindeer, we usually think about Christmas… but if you overlook Hardy’s Reindeer Ranch, located in Rantoul, during the fall season, you’d be missing out on all kinds of fall fun. 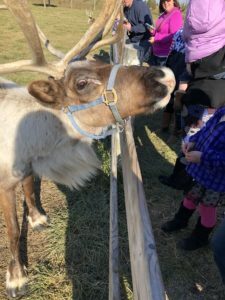 Here are ten things to know about Hardy’s Reindeer Ranch as you plan your short trip from Champaign-Urbana to the ranch with your kids! 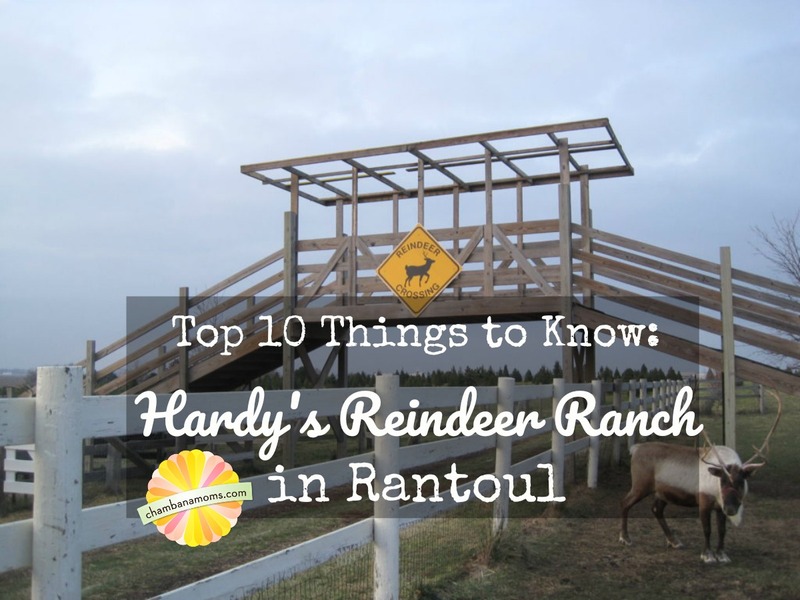 Looking for more information about Hardy’s Reindeer Ranch, like directions? Click here for our “toolkit” post on the Ranch. Your kids are going to get dirty. And you’re all going to love it. Bundle up in the layers, wear the shoes that can get dirty and be ready to shake some sand and straw off your kids’ clothes. 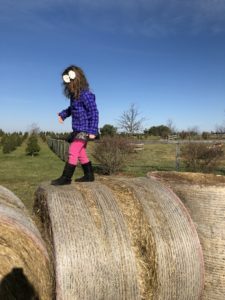 Let them climb the hay bales and play in the sand (who cares if it is 40 degrees outside?!) and have all the fun. There is no gate admission fee. This means you can pull up, wave high to the reindeer (but not feed or pet them), visit the barn gift shop, play in the play area and explore. Fall weekends typically feature “pumpkin cannon” demos that you’ll all love to watch, too. There are a number of attractions you can buy passes for, but it is not required that you spend money to visit. October is the only month with regular weekend concessions available. According to their website, concessions like hot dogs, pulled pork parfaits, and nachos are available on Saturdays from 11am-4pm and Sunday from 12-4pm in October. If you’re visiting at any other time, come up with alternate lunch plans. You will not get close to the reindeer unless you sign up for the “reindeer tour”. There is only one way to kiss a reindeer and that is by stopping in the shop and signing up for a reindeer tour. Planning on visiting between Thanksgiving and Christmas? Make sure you allow plenty of time as reindeer tours DO get filled up and you may have to wait an hour or so, especially if the weather is nice. The corn maze is huge! Hardy’s Reindeer Ranch takes their corn mazes seriously and they make them BIG! If you are navigating a corn maze with small kids, realize it might be a bit cold/dark for them to get all the way through. Have big kids or teens? This will be just right for you! No pets or picnics allowed at the Ranch. Leave Fido at home when you’re picking out your Christmas tree and have your lunch somewhere else after you’re done. Hardy’s Reindeer Ranch has awesome group options. Want to plan a night with your neighbors, youth group, or just lots of cousins and family? Give them a call at 217-893-3407 to talk to them about what you’re thinking of doing and see if they can work out a group package for you. Their website lists a “weenie roast” package for groups of 15 or more that looks like a pretty great deal, with the corn maze, hay rides and pedal carts included! There are pumpkins there for you to purchase. They don’t just sell Christmas trees! Want to add pumpkin-picking to your day’s experience? They have pumpkins available that are sold by the pound. Speaking of Christmas trees, this is the place! 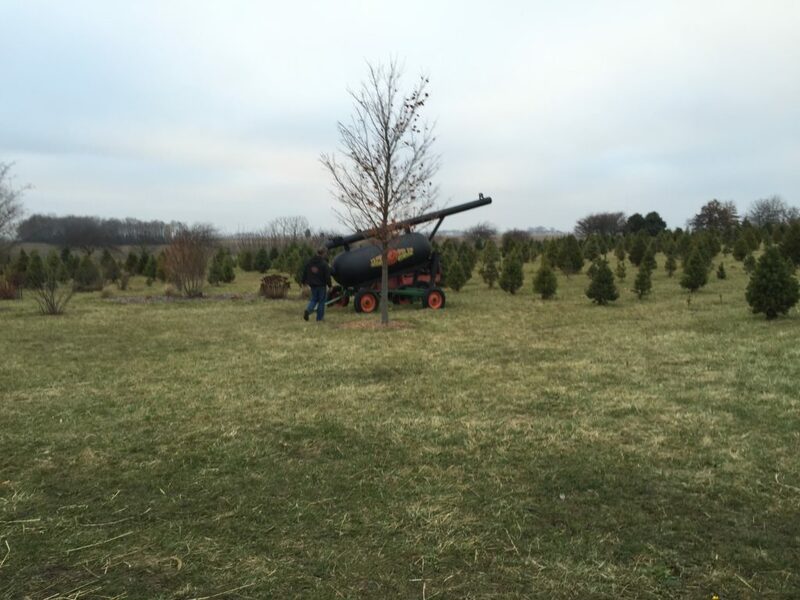 They have saws, a tree baler and shaker available for use as you pick out your Christmas tree. Don’t want to buy one? You can still walk through a picturesque area of growing trees and snap a few photos of your kids for those winter-y photo collages. There’s nothing quite like it around Champaign-Urbana. If you have grandparents visiting or an unseasonably warm weekend you want to make the most of, Hardy’s Reindeer Ranch is one of the more unique attractions you’ll find within close driving distance of Champaign-Urbana. Check it out for yourself and let us know what your kids think!